Formally known as The Twisted Harp, "The Harp", as it is now known, reigns itself as "Perry Hall's Only Irish Pub". And Irish Pub it seems to be. Granted, I'm an "I-tai", as my boyfriend calls me, but after growing up in a South Jersey town, right outside of Philadelphia, I have been around my fair share of the Irish. Usually before going out to lunch or dinner, I check restaurant.com to see if the place we are headed is a participant. More times than not, I don't find the place I am looking for. However, this time, the food Gods were looking down on us! For $4, I got a $25 gift certificate, which I knew would ultimately lead to more food, which I am always a fan of. Bucky and I arrived a little after 7:00pm on Saturday, and met our friends Brian and Donna, at the bar. We were greeted by the bartender, wearing what appeared to be a plaid "kilt". I ordered a glass of Pinot Grigio, and Bucky got a Coors Light bottle. The guys chatted for a while, and Donna and I made the executive decision that we wanted to sit at a table, rather than eat at the bar. This, I was happy about; after waiting on people hand-and-foot 50 hours a week, it's nice to sit at a table, and have someone serve you. Bucky and Brian each had another beer, and after we paid the tab at the bar (which came to $12 for 2 bottles of beer, and a glass of wine), we asked the host if we could have a table. If you've read my blog from the beginning, you should have seen the article about my weariness of an empty restaurant. My mind wandered back to this post, as we were taken to our table, and only passed two other tables of diners. But, it was nice to even be out on a Saturday night, rather than working, so I put it out of my head, and started dinner with an open mind. 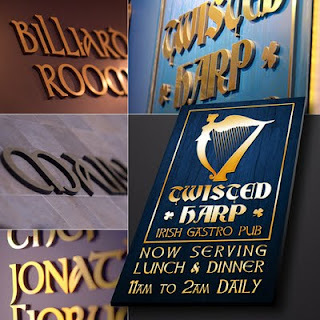 It was hard not to have an open mind after perusing The Harp's menu. Stacked with an array of different items, including flatbread pizzas, entree salads, paninis, sandwiches, seafood entrees, and much more! I opted for Tuna Tempura -- fresh tuna battered in tempura, drizzled with wasabi crème fraiche. Donna and Brian got Chesapeake Flatbread and Crab Fritters. Fifteen minutes later, as our appetizers arrived, we ordered our dinners. Everyone was so full already from the great apps and a late lunch, we all decided to get sandwiches. Brian got a Rueben, Donna got the "Honey Bear Chicken", Bucky got the "BBQ Lumberjack Burger", and I got the "Basil Chicken" panini. Now, how did it all taste?? When my Tuna Tempura arrived, the presentation was great. Arranged on an oblong plate, the tuna was sliced and cooked to a perfect rare. The wasabi cream was drizzled along the top (although I would have liked it on the side, but I should have said that), and there were two dollops of what tasted like cocktail sauce on the sides of the plate. The tempura was crunchy, however, the tuna on the inside could have definitely had more flavor. I didn't taste a crab fritter, but Brian and Donna really liked them, and Brian said the sauce that was on the side was really good, too. I did, however, taste the Chesapeake flatbread, and that was really great! They sauteed the crabmeat in lemon butter before putting it on the flatbread, and dressed it up with scallions, tomatoes, Old Bay seasoning, and Monterey Jack cheese. Although the "flatbread" was more doughy then crispy, this appetizer is a must-try! When the sandwiches arrived, they were all served with homemade crispy potato chips. Brian's Reuben came on marble rye, and even though it was "just a reuben", it was stacked pretty high with corned beef, beer-braised sauerkraut, Swiss cheese, and Thousand Island dressing. Bucky's cheeseburger was served with applewood smoked bacon, Jack cheese, and "Harp" BBQ sauce. Donna's sandwich, the "Honey Bear Chicken", was your normal chicken sandwich, topped with bacon, cheddar cheese, lettuce, tomato, and honey mustard dressing. Now, when Bucky and Donna got their sandwiches, each "sauce" that was served on the sandwiches, was all over the plate! I'm going to guess that their was more honey mustard and more BBQ sauce on the plate then actually on the sandwich, which makes it difficult to eat, difficult to be neat, and just really annoying while you're trying to have conversations. My "panini" arrived on what appeared to be buttered wheat bread, which was kind of disappointing, considering I imagine panini's coming out on crispy focaccia bread, or hearty Italian bread. Inside the sandwich was balsamic vinaigrette, chopped basil, mozzarella cheese, and diced grilled chicken. All-in-all, the sandwich was mediocre. The balsamic vinaigrette was tasty, but the sandwich was just lacking in all areas. I felt as though half of the inside fell out before they brought it out to me. The Harp, though, was a really great place to get together. The menu is stacked, so you can go there over and over, and still get different things each time. The menu is not unreasonable in it's prices, either. We got three seafood appetizers, and four sandwiches, as well as a few beers and a few soft drinks, and each couple put in $40... coming in around $20 per person. This is with the $25 off from restaurant.com, but anyone can join the website and get that same deal! Although some of the food could have been presented better, and some of it could have been heartier, I feel as though they've got a lot of menu items that would be top notch. This is definitely somewhere I want to frequent again, and I would suggest it to someone looking for that type of atmosphere!